Equinox, or as I like to call it, "That Other Really Expensive Gym" just sent me an email on their new April promotion. 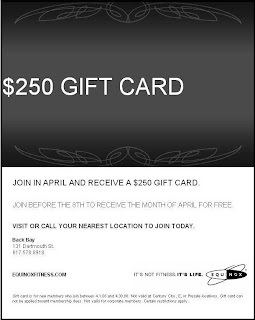 If you join during the month of April, they'll give you a $250 gift card for joining - presumably to spend on massages and yoga mats or whatever else they sell at the gym. $250 worth of protein smoothies perhaps. If you join in this next week - prior to April 8 - they'll also give you the month of April for free. I'm not a member personally. I took the tour and didn't like it enough to leave the Sports Club LA. Email me if you'd like me to fwd the original email over to you. 0 Response to "Equinox April Promotion"